Refer below to learn more about KartRider Dash's Gameplay and Battle Play Features. Nexon's record-breaking online game “KartRider” is going social on Facebook! practice your racing skills by selecting the Quick Start option in Single Mode, or team up with your friends and battle other players in Buddy Mode. - Choose your favorite KartRider Dash character to play with. - Quick Start: Click on Quick Start to jump into the first available race. - Buddy Mode: Click on Buddy Mode to invite your friends to a real-time race. warned, there are no rules! every racer can use any attack or defend items from the mystery boxes that they come across. Plus, the treacherous tracks has dashed the dreams of many KartRiders! 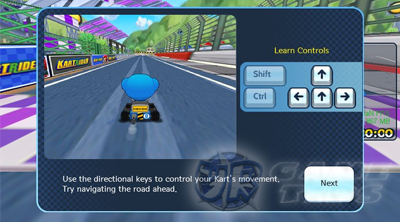 - Use the directional keys to control your Kart's movement. - CTRL keys to use items and SHIFT to drift. - Z key to change the order of your items while racing (requires a Slot Swapper item). - R key to reset your kart if you get turned around.